Charters depart from the Canandaigua City Pier or I can pick you up at the dock of your lake home, cottage or rental. I supply all the gear necessary for vertical jigging and/or trolling using all modern techniques including steel wire divers, seven strand copper, lead core, planer boards, downriggers. You are welcome to bring your own equipment for jigging or casting if you choose. Appropriate seasonal clothing. Rain gear is a plus. Polarized sunglasses can be a great help. A cooler for the catch if you choose to keep some of your catch. I will be more than happy to include complimentary cleaning and fillet of your fish . Fresh Canandaigua lake trout is very mild and an excellent dish that can be broiled, fried, smoked, or baked! I would strongly suggest keeping the smaller 3 to 5lb fish for eating. 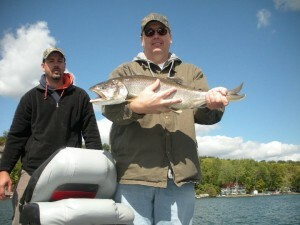 10lb plus Lake Trout are a great fight and take wonderful pictures but don’t make the best table fare. Copyright © 2010 - 2018 ~~ Canandaigua Fishing ~ (585) 301-5949 ~~ All Rights Reserved. Designed by SEO Co.. Code by Halibut Fishing | Salmon Fishing BC | Fishing Guide Canada.